Liverpool fans in Rome were in buoyant mood last night despite fears over possible crowd trouble at the Stadio Olimpico. Police and security forces provided a ring of steel around a loud contingent gathered in a bar in the centre of the Italian capital. A similarly heavy presence is expected on Wednesday as thousands of fans are expected to travel for the crucial second leg semi-final match against AS Roma. One police chief said around 1,200 officers would be deployed, and Carabinieri and city officers were seen stationed at major landmarks including the Trevi Fountain and Pantheon on Tuesday. It comes after one fan said he had been attacked with a metal bar as he and a friend walked back to the hotel on Monday night. Carl Johnson told the Liverpool Echo fans should travel in groups, and added neither of them had been wearing team colours and he suffered minor bruising. The football club's first leg 5-2 win over AS Roma last week was marred by an attack before the game which left supporter Sean Cox in a coma. One of Roma's most revered former players, Francesco Totti, has urged calm, saying: "The world is watching. We are Rome's ambassadors and we carry a great responsibility both inside and outside Stadio Olimpico." Reds fans appeared relaxed and enjoyed a jovial atmosphere while watching Real Madrid qualify to be Liverpool's potential opponents in the final. Around 50 fans in a bar in the Campo de' Fiori area belted out chant after chant in the square as locals and media gathered to film them, while other fans filled the restaurants nearby. 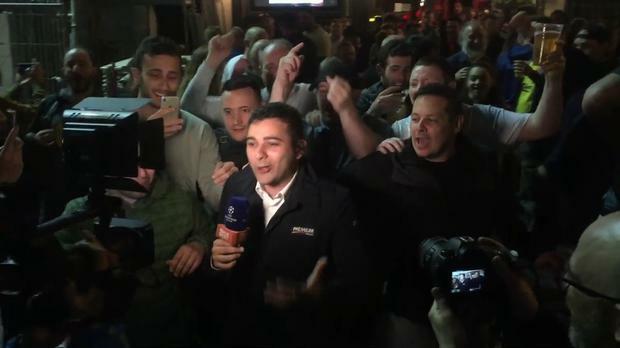 At one point the fans gatecrashed a live link by a presenter on Premium Sports as they revelled in the attention. Ahead of the game, the Foreign Office issued advice to fans, recommending they plan their journey to the stadium in advance and make use of free shuttle buses rather than walk to the Stadio Olimpico. Officers from Merseyside Police have travelled to Rome to assist with the operation. Rome police public order commissioner Giorgio Luciani said officers could "guarantee" fans' safety so long as they "respect the rules". These include not hanging banners on monuments and not drinking alcohol in the street in the city centre and around the stadium. Mr Cox, a 53-year-old father of three, suffered serious head injuries after being assaulted outside Anfield stadium last Tuesday.